What follows is based on a talk I gave at the end of August at one of Brian’s Fridays. See also Parts I, II, IV, V & VI. Politically, these are radical times. In 1906 a Liberal government was returned by a landslide. Elections in those days were very different from the way they are today. For starters, the electorate was much smaller. Women couldn’t vote at all and men had to be over 21 and pass a not particularly onerous property qualification. General elections themselves, took place over the course of a couple of weeks. In each constituency the voting would take place over a number of days and it would not be the same days in each constituency. As a consequence the results would filter in over the course of a week. Up until 1910, MPs weren’t paid at all. If they wanted to become a minister they would have to resign their seat and fight a by-election. The Liberal government introduced the Workmen’s Compensation Act, old-age pensions, sick pay, unemployment benefit for certain trades, maternity benefit, nationalised GPs, allowed Trade Unions to pay strike pay and, as I mentioned earlier, nationalised the telephones. To pay for it all they upped taxes. At this point the Unionist-dominated House of Lords objected causing a constitutional crisis. After two general elections in 1910 and a threat to create 1000 new peers the Lords’ backed down and their power to block money bills was removed for good. Sick pay is not working particularly well. 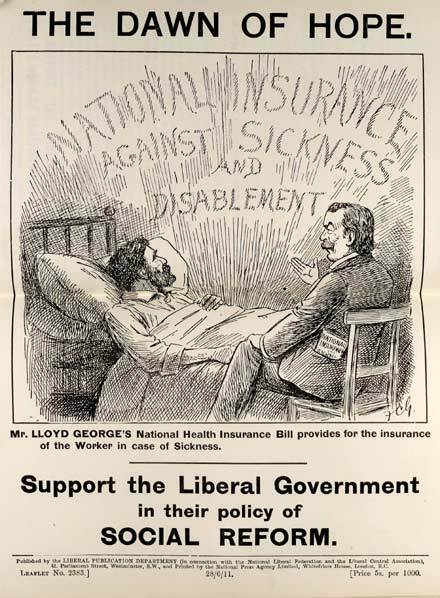 In the days when sick pay was entirely in the hands of friendly societies they had powerful incentives to make sure that people claiming sick pay were indeed sick as indeed did the doctors in their pay. Now that the state bears the costs you will be shocked to hear that there has been a dramatic increase in the number of people claiming sickness benefit. Malingerers, as they are known can get away with it because doctors are signing them off as sick without making a proper examination. In 1910 the Liberals lost their majority and went into coalition with Labour and the Irish Nationalists (one of whom, incidentally, represents a constituency in Liverpool). The price of Nationalist support is Home Rule and the obstacle to that, as always, is Ulster. In the North, men are drilling and guns are being run. The Unionists are in the process of setting up a provisional government. The penny is beginning to drop that this could end in Civil War. The suffragettes are causing chaos. They are breaking windows, destroying mail, disrupting political meetings, and burning down country houses. When jailed they go on hunger strike. Initially, the state force fed them. When this proved unpopular it started releasing them when they became weak and re-imprisoning them when they’d become stronger. Known as the Cat and Mouse Act it simply proves that the state has no idea what to do. It could of course give women the vote. A bill was introduced in May 1913 but mysteriously failed to pass. While arguing against it, the Prime Minister, Herbert Asquith amid much tedious inconsequential waffle argued that the bill would enlarge the franchise both too much and too little and therefore, it should be rejected. To me the election of 1906 and the two election of 1910 are very different. The 1906 election was (or at least seemed to be) about free trade – I (if I had been around at the time) might well have supported the Liberals. Certainly they were “Social Reformers” (pause to spit), but so was Balfour and his Conservatives and Unionists. In 1910 the situation was quite different. The Liberals had “come out” as radical collectivists, and their efforts to turn Britain into a copy of Prussia (indeed to go further than Prussia – in putting unions totally above the law, and providing unemployment “insurance” and so on, undermining the very mutual aid “Friendly Societies” that the Liberals pretended to support) was not supported by most people. The government was very much under the influence of the Fabian Society – as could be seen by the de facto rejection of the “Majority Report” on welfare (written by people who had devoted their lives to helping the poor – people in the tradition of Octavia Hill and C.S. Locke) and the de facto (gradual) acceptance of the Fabian “Minority Report” (which called for the sort of collectivist system we have today). And the British people themselves were not yet dominated by Fabian thinking. However, Lloyd George managed to turn both the elections into a “people against the peers” class-war exercise, and the House of Lords had played into his hands by rejecting the 1909 budget which was DEIGNED with the express purpose of provoking them – with the land tax and so on. Even as it was the elections of 1910 were very close – with the Conservative Unionist actually getting more votes that the Liberals. But with Irish Nationalist support the Liberals had the majority in Parliament. The result was statism at home (for example the 1911 National Insurance Act) and incompetence in foreign affairs. Tragically not making it clear to the Germans that Britain would support France if there was any threat of the invasion of France (and Belgium). Had it been clear to the Germans that Britain would support France (not in a token way – but with total commitment) they might not have been so eager for war in 1914 (so eager that the Imperial German government even FAKED a French attack in order to have an excuse to declare war upon France), and the utter horror of the First World War might have been avoided. A faked French attack. I’d never heard of it. Do you have a source? The German government had to invent a French attack to justify declaring war on France. It was so bungled, and the French government so keen to avoid any provocation that would give the British an excuse to do an 1870 bunk, that the Germans didn’t have time to actually stage a fake attack, merely announced that it was coming. As it happens, the British DID try to betray their ally. Had Germany not attacked through Belgium, I have no doubt the German Reich would have been allowed to destroy France then Russia in 1914. Italy would not have sided with France. This sequence of events wasn’t forgotten in Germany or France in 1939/40. It also shaped Chamberlain’s appeal to Hitler in the summer of 1939 where he tried to get across that Poland really was a step too far. The problem with letting tyrants like Assad gas his own people is that other despots assume they can do stuff like, smuggle radioactive poison into the UK, take over Gibraltar, re-arm the IRA, etc. Appeasement leads to Hiroshima. The Romans had it right: si vis pacem para bellum. Had Germany never built a battleship fleet, Britain might have looked the other way on Belgium too. The only country I’m certain won’t get invaded soon is North Korea. A country whose government has precisely one merit: of projecting itself to the outside world as too dangerous to invade. It’s the model for despots to follow. Rhukatah: I really don’t get why the Kaiser wanted war with the British, and the Zimmerman telegram is total madness. At least the Germans should have tried to blame it on a British forgery. The Zimmerman telegram (and Pearl Harbor for that matter) reflected a failure of German (and later Japanese) leaders to understand the scale of the United States. From their own point of view, this failure actually makes some sense: Compared to the US, the only great power of similar contiguous size with its own political center was Russia. Only the very small minority of elites who had visited the US were really able to understand the differences between post-Civil War America and late Czarist Russia. As for the Kaiser’s attitude toward Britain – it was very much of a love-hate relationship. He was the devoted grandson of Victoria (who literally died in his arms); he was obsessed with British yachting, envious of British naval power and imperial prestige, and jealous and suspicious of his uncle Edward VII. Patrick – the Germans announced that they had been attacked by France (that was their excuse for declaring war). No such attack took place – it was a German lie. This (and other stuff) does not tend to make its way into modern history text books – as it directly contradicts the idea that “we all blundered into war together” drivel that is modern doctrine. The German government (not the Keiser personally – but the high commanders and academics, the people that Ludwig Von Mises wrote about, and he personally knew some of them, wanted war and were prepared to lie to create war). That is what I meant by “faked attack” – I did NOT mean the Keiser ordered concentration camp prisoners to be dressed up in German uniforms and shot (as Hitler did with the “Polish attack” of 1939). The “paper” point is critical. The German Emperor and (even more) the people around him, no longer believed in “paper” promises (they were legal positivists – i.e. that right and wrong were whatever was in the interests of the state, they rejected Natural Law as “old fashioned” or even “Catholic”). They were no convinced by words in support of Belgium – and they would not have been convinced by WORDS in support of France. Especially from people (Liberals) they regarded as weaklings. Only concrete actions would have convinced them – and acted to deter them. The Germanic (“Blood and Soil”) nationalist (like the Islamist) respects only power – only force (and the convincing threat of force). “Whilst his wounds still pain him, he will respect the hand that dealt them”.